Full Visibility for the Passenger! The TrikeBuggy Bullet Tandem is our 2-place machine made for the enjoyment of two occupants. In the USA, Ultralight PPG Trikes are now legal under FAA Part 103 as an Ultralight Vehicle or Aircraft for USPPA Certified Instructors to use as a training tool. The TrikeBuggy Tandem uses an incredibly robust Stainless Steel Kite Buggy as the foundation for this unique PPG Trike. The design is based on our popular Bullet TrikeBuggy with the beautiful Stainless curved tubes. It is also quite easy to dismount the motor for use as foot launch or to transport. The TrikeBuggy Tandem also incorporates our latest innovation - the TrikeBuggy Low Hangpoint System. This allows the use of virtually any Tandem Paraglider wing whether it has trimmers or not. The risers are positioned much lower than most PPG Trikes, bringing the brake position down to a comfortable reach for even the shortest pilots. This system is unique in the industry, since it allows the pilots to use their regular Tandem Certified 2-place paraglider without making any modifications to it. 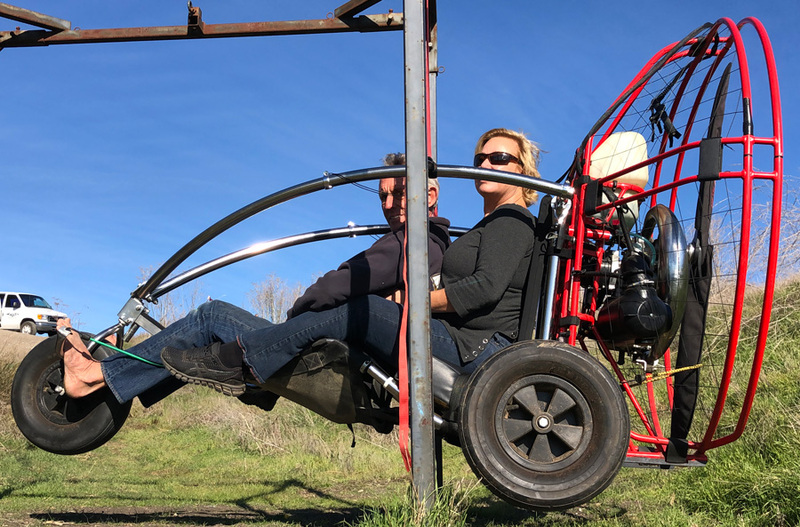 The Low Hangpoint System is also noteworthy because it literally ties the paraglider to the Buggy, eliminating the need for any kind of harness system. You simply sit down and fasten your seat belt and go fly! The low CG (center of gravity) is the same as the other TrikeBuggies, since we are using the same low seat and comfortable reclined seat position made possible by the Buggy. At 7" off the ground, this is the lowest pilot seat of any ultralight aircraft available today. Made from Chromed and Stainless Steel, classic TrikeBuggy quality! Pilot seat in front makes for great visibility for both the pilot and the tandem passenger! Includes new "Low Hangpoint" design! When assembled, the TrikeBuggy Deluxe V3.2 is 73" long (tip to tip on tires) and 63" wide, but the Slider axles can be shortened to less than 3 feet wide!